Seraphina is back in this entertaining and highly anticipated sequel. While it’s still a solid fantasy novel, Shadow Scale never quite manages to hit the high, sweet notes that made me fall in love with Seraphina. Why did I read this book: I adored Seraphina, Rachel Hartman’s debut novel, and the first book in this duology. I loved it so much that it made my top 10 best books of 2012 – I have been eagerly anticipating this sequel since devouring that first novel three years ago. Shortly following the events of Seraphina, Shadow Scale shows us a different side of the eponymous heroine. For the first time in her life, Seraphina is free. For the first time every, she’s free from the fear of hiding her half-dragon, half-human parentage, and lives as a valued, important, even loved member of Goredd’s court. Serving openly as a trusted adviser to Queen Glisselda, Seraphina helps Selda grapple with her new rulership in the midst of a draconian war that threatens the lives of all in Goredd and to the south. In order to protect from impending attack and devastation, the Queen turns to Seraphina and the legend of a magical net that she and her other halfling kind, the Ityasaari, alone can cast. It is up to Seraphina to gather the other half-human half-dragons she has cultivated in her mind garden, and band them together to protect the home, the people, and the dragons she loves. Fellow readers and Seraphina lovers, this is a hard review for me to write. It’s hard because I loved Seraphina so very much when it first came out. I loved the pressures that Seraphina faced in Goreddian society, the thread of music and magic that ran throughout the book, the quiet romantic storyline between Seraphina and Kiggs. I loved the lyrical writing and the fascinating realm of magic and draconic lore that Rachel Hartman wove into ever page of that first book. This is, in some ways, an unfairness to Shadow Scale because I came into the book with such lofty expectations and hopes – especially considering that I had to wait years for this sequel. So in full transparency, all cards on the metaphorical table: Shadow Scale is nowhere near as fulfilling as Seraphina. 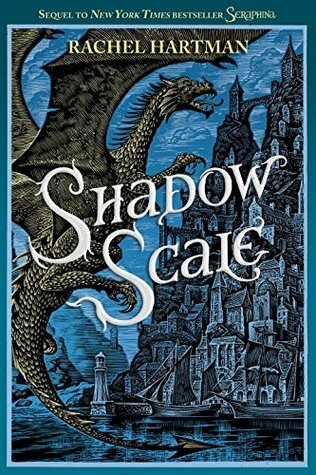 While it’s still a solid fantasy novel in its own right, Shadow Scale never quite manages to hit the high, sweet notes that made me fall in love with the first book. Now please do not misunderstand me: there are plenty of things to love about Shadow Scale. The mere fact that there is more to Seraphina’s story is intoxicating, and I love the expansion to her world that Hartman employs in this second novel. The different cities, cultures, customs, foods, and people are varied and fascinating (I particularly enjoyed the completely unexpected inclusion of Lab Four). I also very much loved getting to know other half-dragons on Seraphina’s travels and their interactions with each other; if you’ll recall, Seraphina is one of the lucky few who can (and, more importantly, who has) passed for human, but not everyone she meets is able to do the same (in particular, the figure of doctor Nedouard is so striking and solitary at the onset of the book). The politics of Goredd for both human and dragon (and ityasaari) are also wonderfully detailed and a strong point for Shadow Scale, as the motivations for war and Seraphina’s mission to gather her half-dragon brethren make sense. More important than an uneven, repetitive plot, however, Shadow Scale is disappointing because it lacks the heart of Seraphina. Where is the music that was so potent and present in the first novel (and prequel novella)? Where is the sensitivity and the underlying romance, and the emotional identity that powers the first book? For that matter, what the heck really happens with Seraphina’s Dream Garden and why is it so quickly and easily abandoned? Why is there a Deus Ex Machina of an ending, that effectively dislodges the Big Bad Guy (who has been pulling all of the strings so far ahead of Seraphina since the get-go)? Why is the war, similarly, so easily resolved so late in the book without the big flippin’ battle the book description promises and that Shadow Scale seemingly builds up to? The one thing about the book’s resolution that I did appreciate, however, concerns the romantic subplot between Seraphina, Kiggs, and Selda. The romantic subplot is firmly relegated to the background in Shadow Scale (as is Kiggs, basically), because though Kiggs and Seraphina love each other so very dearly, there is duty to consider and Seraphina genuinely cares for her darling friend (and Queen) Selda. I love the idea of the subversion that Rachel Hartman employs here with Selda and Seraphina’s relationship, and the ultimate direction of the royal political marriage… at least in theory. In execution? I truly wish that more time was spent on this particular subplot and ending, instead of being glossed over in passing. But, of course, your mileage may vary. For me, Shadow Scale sadly was not quite what I had hoped for in a sequel – certainly, it’s not what I had hoped for as the second half of a duology. I still enjoyed parts of the book very much, but I had hoped for more. Queen Glisselda spotted the dragon first. It was a swift-moving patch of darker darkness against the night sky, obliterating stars and birthing them again. She pointed at it, shouting, “Singleton from the west, St. Ogdo save us!” in imitation of the knights of old. She spoiled the impression slightly by bouncing on her toes and laughing. The winter wind carried the cheerful sound away; far below us the city curled under a quilt of new snow, silent and thoughtful as a sleeping child. Trained spotters had once scanned the skies for dragon battalions from this selfsame place, atop Castle Orison’s Ard Tower. Tonight it was only the Queen and me, and the approaching “singleton” was a friend, thank Allsaints: the dragon Eskar, erstwhile undersecretary at our dragon embassy. She’d helped my uncle Orma evade the Censors almost three months ago, just as the dragons’ civil war was breaking out. Ardmagar Comonot, the deposed leader of dragonkind, had expected Eskar to find Orma a safe haven and then return to us in Goredd, where Comonot had established his headquarters in exile. The Ardmagar had intended to make her one of his advisors, or even a general, but months had brought no Eskar and no expla­nation. She had contacted Comonot, via quigutl device, earlier this evening. Over dinner, Comonot had informed Queen Glisselda that Eskar would fly in after midnight. Then he had taken himself off to bed, leaving the Queen to wait up or not, as she saw fit. It was a very Comonot way of dealing with things. The Queen wearied of him. I hadn’t experienced the glare, but I’d seen the way she looked at my uncle three months ago. Eskar had surely been with him this whole time. I’m sorry to hear that this one didn’t meet your expectations. I have to say I really enjoyed it (and even pine for a re-read seeing your discussion of it here). Like you I was so pleased with how the world was expanded here. In retrospect I do wonder about the absence of music when it was previously so central to Seraphina’s character. I think I wound up giving a lot of things a pass because the novel was set up as being in “unusual” times as it were and necessitating unusual or at least atypical behavior. I will say that the final resolution with the Age of Saints was fascinating and I did enjoy how this book played with what being a myth (or a saint as it were) really means. Well done review. You expressed things I hadn’t quite put my finger on that were bothering me about the book. It’s true that intense love of the first book can sometimes doom one’s experience of the second, alas. I wondered if it would have worked better if Seraphina wasn’t the main character, since, as you point out, she was pretty passive for a lot of this one. But still a satisfying conclusion to the story, and a great world. I look forward to her promised stories set in Goredd. Great review. Really fantastic read this review. You really pinpointed a lot of the problems I had with this book. Additionally, I couldn’t wait for you to review it and see what you thought. I found this book to be rather anti-climatic. All of the building seemed to be for nothing. I also didn’t like the fact that someone who was not even a part of the conflict comes in and wipes the slate clean so easily. It made me wonder what the point even was. In terms of the romance…I’m not sure if my reading of it is accurate or what the author intended me to think. But I found it rather inclusive?…for lack of a better, spoiler free term. If I did read that correctly I feel like the relationship(s) could have been rather refreshing. It’s definitely a different take. I just didn’t like that there was no build up. For me there was not enough character, or relationship development to make this seem natural. Also, I wonder if the author was just ready to be done with this entire story line. It seemed a little disconnected. I enjoyed your review almost more than I enjoyed the book itself. It was so great until about 60% through where I realized the antagonist was basically all-powerful-insane and nothing was working out like I thought it should. And then Orma! My heart. The most hilarious thing to me though was the total deus ex machina at the end. Like that really was…not the ending I was looking for. I hoped the villain could be redeemed or explored a little more in the end, some resolution or something. But alas.